Connection: Easy to connect to WiFi. 1. Motion Detection: Receive alerts on cellphone and take a video when the motion detection kicks in and detects movement. 2. Record:Support Micro SD card recording, Max up to 128G. Saved video can be viewed from cellphone or download the files onto your computer. 3. Power: 3000 mAh 18650 Rechargeable Battery,Or connect adapter with USB cable. NOTICE:The battery is a backup battery to keep the camera working when the power sudden blackout.We do not promise the working time of the battery.We strongly suggest you to keep the USB power on all the time. Note: If you can not search the camera's built-in WIFI hotspot, pressing and holding the camera reset button for 8-10 seconds ，will camera to restart. 1. 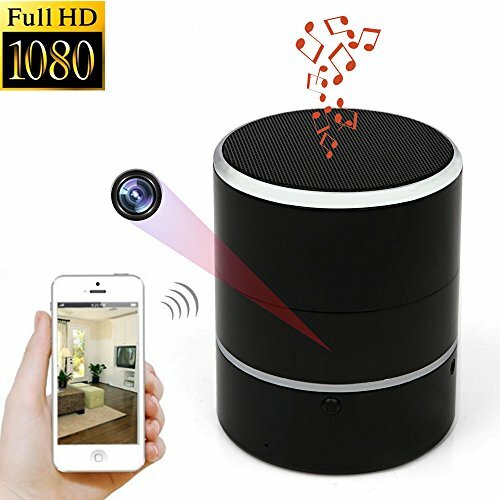 PTZ Lens Rotation: This is a 1080P HD hidden spy camera, with a Bluetooth wireless speaker; the speaker and the camera can be used simultaneously. It supports PTZ camera lens left and right rotation through 180 degrees, use the APP to control the lens on the camera, which will rotate, giving the camera a wider field of view, and nobody will figure out that it is a camera. 2. Remote monitoring: When you connect the camera via your router using your smartphone, tablet or iPad, you can remotely monitor your home or shop from anywhere, and it can work without a SD card. It can monitor your room, warehouse, shop, or even your nanny, for the safety of your property and family. 3. Motion Detection: When the camera senses movement, it will notify you through the phone APP (the phone will need to have the notification function turned on) and will automatically take a picture and save it in the photo album within the APP. You can also set the motion detection to record video, which will be automatically recorded onto the SD card. 4. SD card. The camera supports a memory card up to 128 GB SD memory card (not included); it can also be set for motion detection recording, 24-hour recording and time-lapse video recording. It also supports circular recording, so that when the SD card is full, it will automatically overwrite old videos, and you do not have to worry about the capacity of the memory card; you can also view and download the contents of the SD card video through the APP. If you have any questions about this product by WNAT, contact us by completing and submitting the form below. If you are looking for a specif part number, please include it with your message.